Project Management / General Construction - Drolette Construction can handle the oversight of all your construction projects. We will communicate between you, the vendors and all the sub-contractors. Let us provide you with our knowledge and expertise to guide you through your dream projects. We will strive to make the process as easy as possible for all involved. 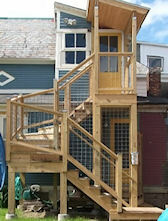 Renovations / Additions – From the smallest bathroom to a second floor addition we can handle it all. We know that renovations and additions can cause considerable upheaval in a home or business. Drolette Construction does their best to keep work areas safe and clean. Protection of a customer’s home, property, or business office is of the utmost importance when completing a project. 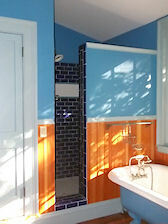 Kitchens & Bathrooms – Kitchen and bathrooms are the two most popular projects for any home owner. We can help you design your dream space and make it come true. Window / Door Replacements – Are you looking to replace a single window or all of your windows and doors, if so we can help you. After a consultation regarding the type of window or door replacements you are interested in, we will call in a local window and door specialist to consult with and find the best fit for your home or business. Roofing - Drolette Construction has experience in installing a variety of roof types and will be happy to consult with you on the options available to you. Since roofing jobs can be tricky in the uncertain weather in Vermont, Drolette Construction works closely with you, the customer to provide the best results. Painting - Does your house need painting or maybe just that bookshelf? We can help you brighten up your house or any part of your house with a coat or two of paint. Other – Any project that has to do with construction please, do not hesitate to ask us. I bet there is a good chance we have done it once or twice over the years. Handyman – Just need one person to help with odd jobs? With our experienced staff we can handle most projects with ease. EMP Lead Certified / Lead Certification - Drolette Construction holds the latest certification required to do construction on buildings that were constructed prior to 1978. When getting prices to do your work it is best to ask your contractor if they hold a lead certification and are a lead certified firm to do this work. Fully Insured - Drolette Construction is fully insured and only uses fully insured sub-contractors.